There should be a way to delete Devices that are listed in Recently on your network section. Also have a date and time stamp of the last connection. Unknown devices pop up. They are probably legit or it might be someone that has access to your wifi password. 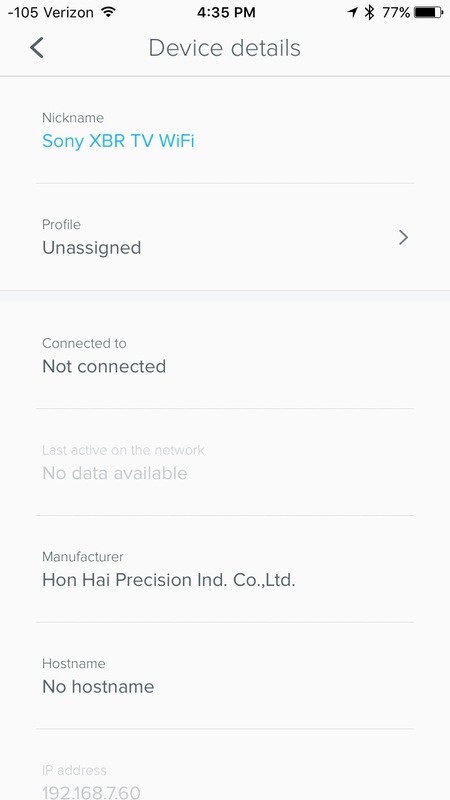 Forgot to update here, but we recently added the ability to see when a device was last on a network. It will only be visible for devices that are found under the section Recently on your network. I have changed this request from Completed to back to In Review. After reviewing the majority of the discussion taking place here, while we have implemented the request of a time stamp, the bigger request here is the ability to remove devices from the Recently on your network list. Thanks for your feedback and welcome to the eero community! This is invaluable feedback for our team as we continue to roll out feature improvements. I have passed it along for consideration, and will update this topic should anything develop from it! Thanks again! Love Ray's suggestion. Add me to the camp interested in doing this. Yes the ability to see the last time it was connected would he useful for me also. Add me to the "remove recently seen devices" group. I have over 30 and more than half I'll never see again. Curious... I just noticed this was marked "completed". Is this in the next app update or did I miss something? DMcWetty there were two feature requests with this post and we can't set a status to convey that one has been implemented. While you can't remove devices from the list, the time stamp is now available. I'll be sure to update this thread should we implement any other requests from the original post. Jeff C. Thanks for clarifying. I specifically want to see previous devices removable. I appreciate the timestamp, it is helpful, but removal is more important. DMcWetty happy to share the continued feedback/interest with our team. And just in case you didn't come across the other post about devices recently on the network elsewhere in the community, if a device doesn't have activity on the network for seven days, it will fall off the list. I've been on my eero network for about a month. Shortly after initial installation I had a device connected to my network that I decided to remove. It stayed on the "recently connected" list for a couple of/few days then dropped off...never to be seen again. Jeff C. I'm not sure if my app is operating properly then. I have devices on the previous seen list that have not been in my house for over a month that aren't connected to a profile and won't go away. Suggestions? That definitely shouldn't be the case. Could you please contact support so they can take a look and file a ticket if there is a potential issue here? Please send an email to support@eero.com and include the screenshot as well. We will be able to take a deeper dive into what is happening here. One other item I noticed is a Wired device that is shutdown/offline continues to show in the Currently on your network list. Since the device is shutdown, it shouldn't still show connected. I know WiFi devices will drop off when they're no longer connected on the eero network. Wired should work the same. With regards to the wired devices showing as connected while off, despite not being powered on, there is a chance that the Ethernet port on the device is still active. There is also a chance it the device is in some form of power save mode vs. actually being powered off. You can test this by pulling the power connection on any troublesome devices to see if it changes the state in the app. In the end, it really varies based on the client device. If you'd like, you can reach out to support@eero.com and our team can take a look and shed a bit more light on what is potentially going on. Jeff C. Thanks. The device is a MacBook Pro Retina with an Apple ethernet to Thunderbolt adapter and it wasn't and still isn't plugged into any power source. I was testing an ethernet port on the 2nd eero device in another room to be sure it would connect the device. When the test was completed, I unplugged the ethernet cable from the eero and Mac; then shutdown/powered off the Mac. 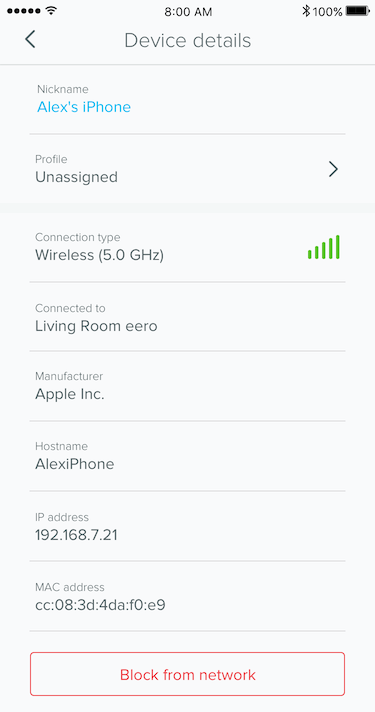 It still shows in the Currently on your network list while the WiFi entry for that same device shows correctly under the Recently on your network list. Thanks for following up. Would you mind contacting support? We should take a look if that's the case in case there is something our team should look into. Jeff C. No worries. I just got off the phone with Support and was told it's an issue for others too and a ticket was already opened for it. I mentioned I knew it is not an issue with the eero devices but rather just a feature I would like to see to remove items from the lists within Connected Items in the mobile app. Thanks for your quick replies! This feature request coincides with mine. I strongly agree that this feature should be added. Please see this for additional enhancements to it. Jeff C. Absolutely, yes, yes, yes. Please add a 'forget this device' option to devices attached and in the list. Thanks for your continued interest and feedback in this feature. With the release of eero app version 1.5.3, we have introduced device blocking! You can now block any device on your connected or recently connected device list, restricting it access from your network's internet. You can find out more at this help center article. Thanks Jeff and the development team. I also didn't realize what you mentioned earlier about after 7 days a device will fall off the list with no activity. That feature works well for me too. Well I noticed these replies are 1-2 years old😢 I’ve noticed my “recently connected device” which happened to be a Apple TV is still hanging around on the list, I wish you could just manually delete them. That device hasn’t been in home network for over 6 weeks. Hi Rsoaker27 – Thanks so much for taking the time to share your concerns! As mentioned elsewhere on this thread, devices will drop off the Recent Devices list in the app after 7 days of inactivity. You can tap on each device's icon individually in the app to see the "last connected time" to get a better idea of when it'll drop off. Past that, please feel free to give us a call at 877-659-2347 with any concerns about the functionality of the app and we'd be happy to go over things with you!